A few years ago Jamo was one of Europe's largest speaker specialists, making a huge range of uncommonly stylish designs in a large and highly automated factory on the Danish coast. Big changes have happened since then. First, the factory was closed and manufacturing transferred to outside sources (probably Chinese); then the brand itself was purchased by US collective Klipsch. The two companies' operations dovetail rather well across a global stage, with Klipsch strong in the US, while Jamo is big in Europe and China. 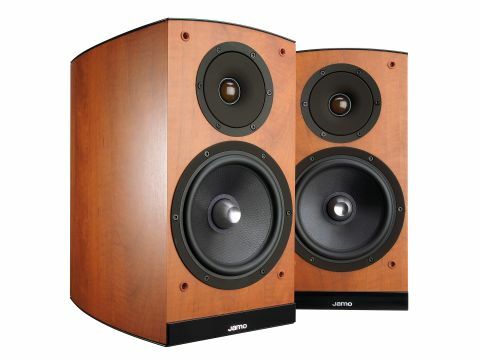 A solidly build and attractively finished large standmount, this £700 per pair Concert 803 is strongly reminiscent of the Concert 8 that was part of Jamo's line-up for many years. One major difference, however, is that the 803 is just half the price of its predecessor. And if it doesn't have quite the same top quality veneerwork, it's still a very good looking loudspeaker, with attractively curved sides, and a domed top which looks and feels like smoked glass. Curved panels not only increase stiffness, they also help de-focus internal standing waves, so there's a performance as well as a style bonus. Chunkily built and shaped, and weighing a hefty 10kg, the 803 has a good size 180mm bass/mid driver with a cast alloy frame and a 125mm diameter cone made from paper, sandwiched by woven glassfibre. This unit has a cunningly shaped alloy polepiece, and what Jamo calls an Active Impedance Correction system, using an extra coil inside the voice coil, but with opposite polarity to counteract inductance variation and flux modulation in order to reduce distortion. A 25mm fabric dome tweeter is mechanically decoupled from the vibrations generated elsewhere in the speaker, and is loaded by a shallow, wide 'waveguide' horn flare, to better manage dispersion through the crossover region. The generous rear port has a special convex tapered vent, claimed to reduce turbulence. Two pairs of terminals are fitted for the bi-wire option, but the supplied links block the 4mm sockets, which will be inconvenient for those using 4mm-equipped mono-wire cables. In most respects, the 803 proved an effective and entertaining performer, with good dynamic behaviour and very little box coloration, but there were also two areas of criticism - one at each end of audio band. Even with speakers on 600mm stands and sited well clear of walls, the bottom end has a tendency to thump (on some material at least), even though the actual bass quality seemed pretty good. While this bass excess can bring a good sense of scale and weight to the sound effects and orchestration of movie soundtracks, a walking bass, for example, tended to show its unevenness up in a rather less favourable light. Experimenting with port-blocking did not prove successful, as reducing the bass output tended to highlight the rather too strong treble output. While there's certainly plenty of explicit detail on offer, the top end seemed to be constantly drawing attention to itself, and this can become a little wearing, even though it is quite clean and sweet. Speech, in particular, has a slightly 'lispy' character, alongside a degree of nasality and a slightly 'hollow' quality, while male voices sounded a little chesty. However, these criticisms were minor and much less obvious with music program, where the drive units and quality standmount enclosure combine to deliver a dynamically expressive, detailed and spacious sound that is both involving and easy to enjoy.